When I was about 17 years old I spent a season working on the boats down at the Hove Lagoon, whilst in between jobs. The small pool used to have paddle boats, canoes and rowing boats, which were hired for about 15 minutes at a time. They all had numbers on them and they were called back by voice. The large pool had motor boats and later some yachts. The boats were anchored in the centre of the pool each night and a couple were left in small pool areas behind the walk way. They were never damaged or interfered with. The pools were run by two employees Stan, an ex-seaman who always wore a captain’s hat and had very rugged features, and another ex-seaman called Bill a very quiet and reserved man. I worked with a guy called Tony Pond, I wonder if he is still around. I remember well the trains and the bells that were on them. Just west of the trains in the lagoon there was a small pitch and putt. I well remember the ice creams dipped in the chocolate. This was a very happy time and I loved working out of doors, and repairing the engines on the motor boats when they occasionally broke down. I lived in St. Leonards Avenue so I could easily walk to the lagoon each day. 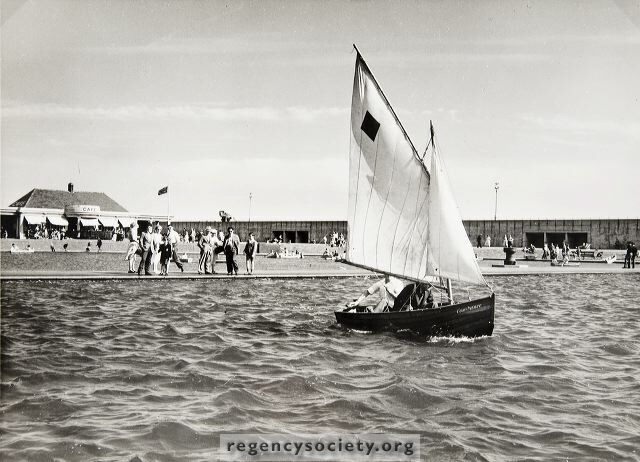 Do you remember visits to Hove Lagoon? If you can share your memories with us, please leave a comment below. Not only the dates Dave, but what number did you live at in St Leonard’s Avenue? I lived at number 9 from 1949 to 1959. I remember Hove Lagoon very well, I used to live in Adelaide Crescent till I was 17 and then in Medina Terrace, so we had lots of walks along to the Lagoon: Happy days. Before you got to the Lagoon there was King Alfred swimming baths and just before them was a kiddies playground with rides. My Mum used to give the change there, she had a little hut and on nice days she could sit in her deck chair and watch the children enjoying themselves. I seem to remember the people who owned the site invited Mum to their wedding in Lewes; I wonder if they look on this site? Yes, Stefan, I lived at 176. Wow – amazing you knew that!